Angry Birds Star Wars was a huge success for Rovio in the video game and merchandising worlds. That said, the company just revealed the sequel, aptly titled Angry Birds Star Wars 2, and there's more to it than new characters and levels. This time around, users will be able to transport their favorite toys into the game similar to the Skylanders and Disney Infinity titles. Gamers will place these Telepods onto the screen and they'll automatically appear. Not only is it the first time we've seen something like this in a mobile/tablet game, but users can also mix and match characters. 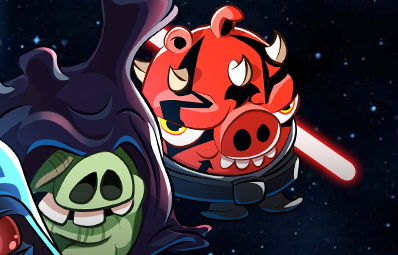 Want Darth Maul pig (new to the series) teaming with Yoda or Mace Windu? That seems like a possibility. Watch the first trailer and get ready for more Angry Birds Star Wars 2 coverage leading up to the game's September 19th release.